Google Chromecast Streaming Media Player. See It. Stream It. Affiliate links within this post may be commissionable. Chromecast is designed to make the most of the apps and entertainment already on your phone. Shows, movies, live TV, YouTube, photos and more. It’s all just a tap away from all of your family’s devices. With rising cable costs, many Americans are “cutting the cord” and choosing to get their entertainment from on-demand streaming services such as Hulu and Netflix. 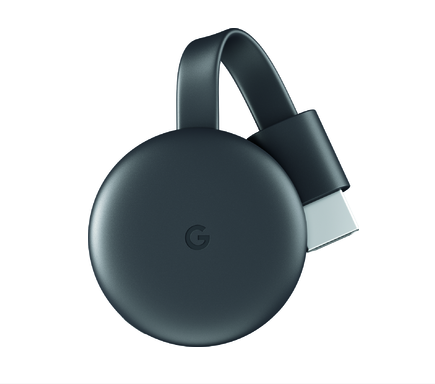 I too am a “Cord Cutter”, so even though Best Buy has compensated me for sharing product information with you in this blog post, I am genuinely excited about the newest generation of Google Chromecast. I don’t have cable either, I subscribe to a variety of streaming services that allow me to watch more customized entertainment to suit my viewing tastes. With the new Google Chromecast I can stream my Korean dramas from Viki and Dramafever, or catch up on the latest Japanese anime with Crunchyroll and Funimation. And unlike my Roku, or PS4, I can even play Android games on my bigscreen TV. This is a huge win for girl gamers. Check out my sister site at http://otomeplay.com for hundreds of otome games, RPGs, Simulation, and Anime Dressup Games available on the Google Play Store. Google Chromecast is much more than just a movie-watching device. I also love that the newest generation of Chromecast can be controlled with your voice; my old Chromecast couldn’t do that! Plus at only $35, it is one of the most affordable streaming media players on the market. Plug Chromecast into the HDMI port on your TV and to power and stream your favorite entertainment right from your phone with just a tap. Watch shows, listen to playlists, and more. And while streaming, you can still use your phone as you normally do. Expand your home entertainment without buying a new TV. It’s so affordable you can get one for every TV in the house. Built-in 802.11ac Wi-Fi connects to the Internet through your wireless home network (wireless router required and sold separately). Easily connects to high-definition televisions with HDMI connectivity. ¹ Subscriptions are required to view some content. ² Google Home, Chromecast, and compatible content required to cast to a TV using Google Home. Web-based services and content require high-speed Internet service. Some services may require a subscription. Jenilee Dunson is a geek, otaku, and lover of all things kawaii. She runs a blog in her spare time at http://geekysweetie.com where she writes about video games, kdrama, anime, technology, toys, dolls, and kawaii fashion. In 2006, Jenilee graduated with a BS in Emerging Technology and Design. In 2012 she obtained an MBA in Ecommerce. Jenilee currently works for a small manufacturing company designing websites, email marketing, digital advertising, and print advertising campaigns. If you enjoy the content provided on this site, the button above will allow you to make a donation in any amount. Anime por MEGA on Tokyo Anime Mega Bundle of Steam GamesWhen will those offers come back? Mohit Verma on Top 10 Nintendo Switch 2017 Games for GirlsWow great list of girls games. Blogs DirectoryRSS Feed DirectoryWant To See Your Site Here?Link to Geeky Sweetie and send me an email with a link to your site for consideration.Not All Sites Will Be Accepted. There May Be a Delay. Thank You for Your Understanding. You Can Always Purchase Advertising On This Site As Well.